How about introducing a new feature to insert a date or number as an attribute of tags? For instance, we may need to insert two dates, one for the due date and the other for the date I actually completed. In the case, we can insert e.g. @due(2018-07-01) @done(2018-06-30) to the task. Another example can be @priority(2). TaskPaper is supporting the feature and I found it is useful for many cases. Yeah I like this idea, it could be a flexible way to setting priorities and for time-tracking. I love me some tags! And I love that you guys are taking on all the stuff that workflowy is ducking But workflowy is simple, to the point of being simplistic. So in WF for really important tasks I just append with four exclamation points, the b list gets three !!! and so on. The nice thing is that you then just go to the search box, type in four exclamation marks, and you see the short list, you delete one of those exclamation marks and you see the bigger list and so on. I’m all for functionality, and if it helps people thats fantastic, but I wonder if its a really big hammer for this nut? It does not bother people who don’t use it, at all, unlike the four menus that you never use in Photoshop. You can just pretend it doesn’t exist and it won’t affect you one bit (at least we hope we can make it so). It’s super flexible for quantitative data. I know you can workaround @priority(4) with “!! !”, but it harder to work around some other cases, like tracking time with @spent(5) or assign tasks with @assigned_to(amanda) vs @assigned_by(amanda). With plain tags, it can be hard to search for items that are assigned to amanda without seeing stuff that are assigned by amanda, unless you add specialized tags for both (#assigned_by_amanda and #assigned_to_amanda). 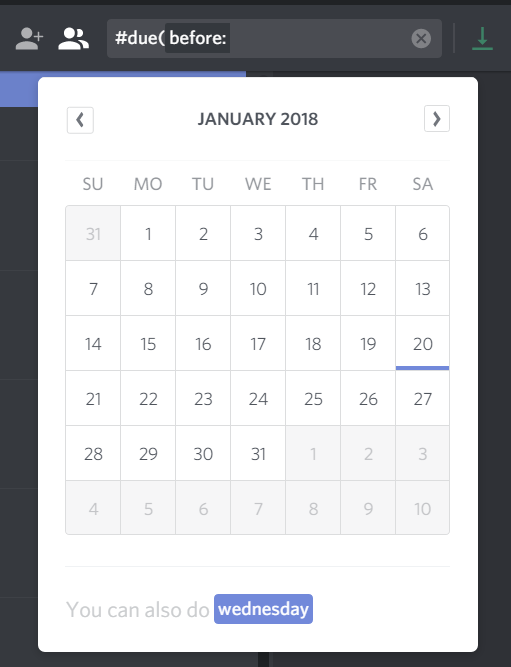 There could be workarounds, just like how people work around dates in WorkFlowy, but it’s different than being supported natively, just like it would take a crazy WorkFlowy extension to sync those custom dates to Google Calendar. Of course, this is just my current thoughts, could change anytime in the future. No plan to act on this immediately. I really like this idea. It expands tagging from simple on-off flags to key-value attributes. This would be huge for tracking and data analysis. Thanks for considering it. Fantastic and responsive support! Thanks. Super cool, really appreciate the thoughtful kind answer. Hey while we’re here, can I bend your ear about something else - cuz this brings up another point as to how you are using these different hashtag types. So in the past (yeah yeah I’m all Stockholm syndromed from WF) I’ve used @ for people. And I’ve used # for verbs and nouns. When I click on #call I can see everyone I should call, including Amanda. And right before I speak to amanda I click @Amanda and boom, I get the full history of when I spoke to Amanda in the simple calendar function I run in the outliner - because every time we’ve spoken in the past, I’ve made a brief note and tagged it @Amanda. Here it seems you are using @ and # in a more expansive sophisticated way. But it also seems a bit looser. For example what I was expecting when I clicked on the “tag” list view was to see all the @people followed by all the #verb/nouns. What you show, of course, is all the tags alphabetically regardless of # or @. I’m wondering if it would be possible to have, for us simpler folk, a bifurcated list option with the @'s and #'s grouped. That way I can quickly look through my address book for someone. The way its currently implemented seems a bit chaotic to my eye. Or maybe there is way of filtering the tags? - if there is, please let me know! Or maybe I’m thinking about this all wrong, and I should just make everything a #, including people? Would love to hear your thoughts on this. Thanks for continuing to expand my horizons and this product. Very cool. Just to clarify, regarding the “list”, are we talking about the list when you type # or @ (auto-completion list), or the list in the tag pane on the left (which is a Pro feature)? I was talking about the tag pane - the good news is as soon as you hit # or @ you get just that list as it autocompletes. Maybe thats good enough, I guess just when I saw the tag pane list I expected to see all the @people grouped together. But it seems you are probably using @ in a more sophisticated way than me. I’d say that’s coming soon… once alphabetical sort in tag pane is in place, sorting will automatically group # tags together and @ tags together. Also, if and when tag attributes are added, it would be nice to be able to query both dates and numbers with gt, gte, lt, lte operators. Congratulations again on a truly fantastic product and even more fantastic relationship with your user community. Thanks! And we thank you for being in this community and making such amazing contributions to discussion. That does look pretty awesome! Imo a very closely related feature of Tags colud be the temporal inheritance of parent Tags for search results. I have started testing / theorycrafting Dynalist 1-2 weeks ago, and the only thing keeping me hesitant about going Pro is this. I place “root-tags” into the first comment line of the Document title. Things like #[ for any action item , @a for application name beginnings etc. Below the first Bullet point is the full tag-matrix. that contains the completion of the root tags. For action items for example: # #[!] # # # #[II] #[×] ; for others like @a.Dynalist. Punctuation caracters within Tags have the benefit in search field that they allow combining. So this way i dont have to type anything, just click on a root tag and then click on some more related tags that will show up from the tag-matrix. This is proven to be very fast and effective to reach to any specific content rapidly. If I was about to store content for example grouped by month, giving the parent the name or tag #November. If let say I’m looking for #iDea s from #November the only way to find them would be if I added the tag #November to every single item below it, because if I select both tags in the searchfield it will show 0 results. I can imagine scenarios where the more strict filtering is benefitial, so maybe It could come as a selectable search option, just as when I decide if Im searching locally or globally. Please guys and devs comment on this. 1. Can you think of any better approach / workaround to unbreak my system? 2. Or if you also feel the potential in the suggestion, can you make this “simple?” feature part of the upcoming Tag-attribute update? … so how to come around that?? To combine the best of two worlds (nodes and comments) maybe a LOCK feature could be applied. If a lock is ON for a node it would mean that all subnodes count as “part of” the mothernode - that would allow making more flexible notes… If the lock is OFF, child nodes would behave as they do now.